Design: Arne Jacobsen. Read books and magazines with the 51.2" tall AJ Floor Lamp by Louis Poulsen which provides the best type of reading (yellow/blue) LED/halogen/indandescent light for your eyes. A design from the 1950s, Louis Poulsen's minimalist "AJ FLOOR LAMP" sets a modern silhouette in your mid-century modern home with its weighted concentric base and an adjustable steel drum shade. Made for bookworms, the slim-profile offers stability in a small footprint while its adjustable one-light design creates a stylish highlight in the bedroom or living room. AJ mid-century floor standing lamps are an original creation by the Danish architect Arne Jacobsen who is acclaimed for his clean lined designs and alliance to form and function. Louis Poulsen's high-quality AJ Floor Lamp (1957) is a member of the stylish AJ-lamp family, a series of Danish minimalist reading table- and floor light fixtures designed by Arne Jacobsen to produce direct and undifused floor reading light. 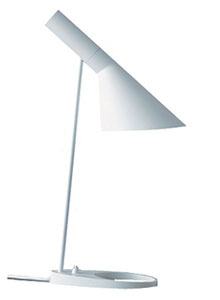 AJ Floor Lamp by Louis Poulsen; designer: Arne Jacobsen - manufactured under license in Denmark by Louis Poulsen Dimensions Overall (inches): 51.2" (130cm) height with 13.8" (35cm) diameter shade. AJ Floor is a modern and stylish lamp for direct illumination. This practical floor lamp is a masterpiece of Danish design created by Danish architect/designer Arne Jacobsen (1902-1971) for Louis Poulsen. Jacobsen's multidisciplinary career was hallmarked in 1957 when he designed the Royal Hotel SAS in Copenhagen Denmark. This AJ Floor Lamp is part of the original interiors which he designed for the hotel.